MHQ is a Special Purpose Vehicle /SPV/ established for the realization of Markan investment project - mixed-use building comprising A Class offices together with International Hotel. The Building is located on Tsarigradsko Shosse Boulevard. It is the first building of its kind in Sofia to successfully combine two such uses. The location is highly prominent with excellent visibility and accessibility - less than 5 minutes away from the Airport and less than 10 min to the city centre. 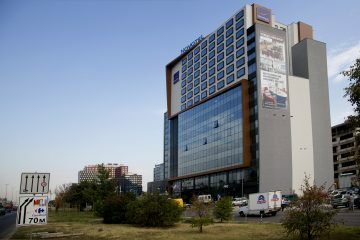 Novotel Sofia is operated by the International Hotel Operator AccorHotels - the world’s leading hotel operator and market leader in Europe. AccorHotels operates in 95 countries with nearly 240 000 employees in more than 4000 hotels. The Group offers to its clients and partners nearly 45 years of know-how and expertise.